Small particles in the atmosphere cause haze and impair the visibility in our protected scenic areas. The particles that create haze are both directly emitted and formed by reactions in the atmosphere. The Regional Haze Rule addresses particulate matter (PM) pollution as it relates to visibility impairment in scenic areas. Air pollutants come from a variety of natural and manmade sources. Natural sources can include windblown dust, and soot from wildfires. Manmade sources can include motor vehicles, electric utility and industrial fuel burning, and manufacturing operations. Particulate matter pollution is the major cause of reduced visibility (haze) in parts of the United States, including many of our national parks. 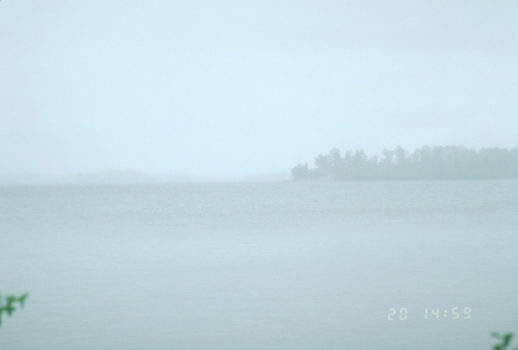 The images below show Voyageurs National Park on a clear and on a hazy day. The comparison of these photographs demonstrates the reduction in visible range caused by haze. Visibility can be generally defined as a measure of how well an observer can view a scene. Malm (1999) says this includes how far one can see in the atmosphere as well as the ability to see the textures, forms, and colors of the scene. When views are impaired by haze or dust, our ability to enjoy scenic vistas suffers. Haze can be formed naturally from wind-blown dust and wildfire smoke, but in the LADCO region most haze is caused by man-made pollution. Haze forms when gases (SO2 and NO) are emitted by combustion sources and react and condense into particles or droplets, which can be transported long distances. These particles scatter sunlight, obscuring views of distant objects, as depicted in the figure below. 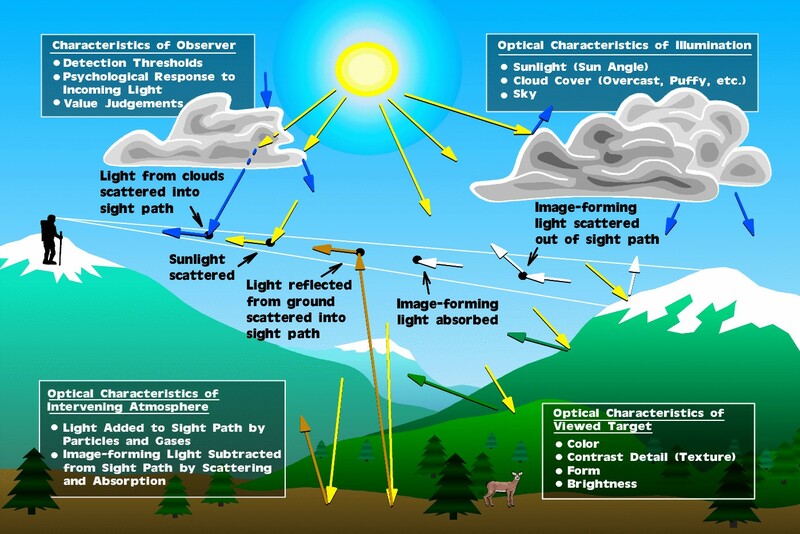 The degree of scatter depends on the composition of the particles as well as the humidity, sun angle, and cloud cover. Visibility can be measured directly with instruments that detect light scattering. More often, it is calculated from measurements of fine particles that have been analyzed for their chemical composition. These chemical measurements also give us information about the sources of the particles and whether they originate from natural or anthropogenic processes. A network of monitors across the country collects these particle measurements and LADCO and the states track trends in haze. Visibility across the region has improved markedly as a result of reductions in SO2 and NO emissions from coal combustion. Source: Malm, W., An Introduction to Visibility, Cooperative Institute for Resources in the Atmosphere (1999). In 1999, EPA promulgated the Regional Haze Rule (RHR) to improve and protect visibility in the nation’s national parks and wilderness areas. Because the fine particles that impair visibility can travel for hundreds of miles, the RHR requires all 50 states to work together to develop strategies to reduce their emissions and impacts on the parks. These same particles have significant human health impacts, so actions to comply with the RHR and improve visibility also improve public health and reduce certain particle-related environmental impacts such as acid rain. Under the RHR, states must make reasonable progress toward the goal of “no manmade impairment” in national parks and wilderness areas by the year 2064. One of LADCO’s roles in regional haze is to help the states determine what control measures will be most effective in meeting the visibility goals at each of our scenic areas. We do so by developing emission inventories, both current and future-year, and modeling the air quality and visibility impacts of changes to various pollution sources to find workable scenarios. 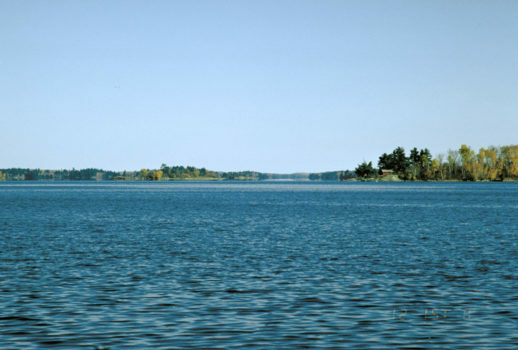 Since the passage of the RHR, the LADCO states have made steady progress toward improved visibility at our regional parks (Voyageurs National Park, Boundary Waters National Canoe Area, Isle Royale National Park, and Seney National Wilderness Area).